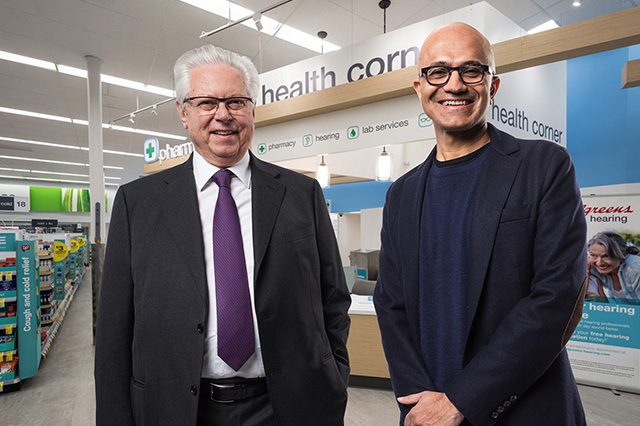 WBA and Microsoft will work on developing a connected, consumer-centric healthcare delivery and management platform to improve access to healthcare. The companies will also focus on providing more personalized healthcare services, leveraging Microsoft’s cloud and artificial intelligence (AI) technology platform Azure. The companies will establish a single platform to better connect consumers, providers, pharmaceutical manufacturers and payors. WBA will migrate the majority of its IT infrastructure to Microsoft Azure as Microsoft becomes WBA’s strategic cloud provider. Drugstore retailer WBA and technology giant Microsoft have entered into a seven-year agreement which includes developing software and technology for patient care management and retail store operations. This alliance follows close on the heels of last month’s deal with Alphabet’s life sciences business Verily to help patients manage medication. Through this partnership, WBA will be able to leverage Microsoft’s cloud services suite Azure. The suite of tools and applications uses several cutting-edge technologies, such as cloud, AI, the Internet of Things (IoT) and blockchain. Microsoft has developed a host of healthcare tools, such as a smartphone app to connect users with healthcare providers and AI-based software engines to crunch masses of patient data to help detect possible health conditions sooner. These are the key facets of the partnership. The goal is to deliver 24-hour virtual care by linking WBA stores and health information systems to people through digital devices. The companies hope providing on-demand access to healthcare consultations will improve patient adherence, reduce emergency room visits and hospital admissions. WBA and Microsoft will develop a suite of chronic disease-management and patient-engagement applications, as well as a range of IoT devices to manage less-severe chronic conditions. WBA may also develop lifestyle management applications such as nutrition and wellness, delivered via digital apps or through in-store advice. Both companies propose a single platform to connect a number of links in the healthcare chain, including consumers, Walgreens and Boots pharmacists, pharmaceutical manufacturers and payors. WBA and Microsoft will use each other’s market research to determine the most suitable providers to develop applications for the platform. As part of the agreement, Microsoft will become WBA’s strategic cloud technology and services provider. This will see WBA migrate the majority of its IT infrastructure onto the Azure platform. This includes transforming the technology used across WBA’s retail, pharmacy and business services. By centralizing data collection and sharing it across WBA’s business operations, Microsoft can build out new data analytics abilities for WBA. The companies will establish joint innovation centers in major markets, and trial up to 12 store-in-store “digital health corners” that sell select healthcare hardware and devices. The US drugstore retail sector is broadly consolidated with few dominant firms and little room for new players—suggesting the sector is mature. But while new industry players may find it challenging to break into drugstore retail, several outsiders have threatened the positions occupied by longtime titans WBA and CVS Healthcare. While the Amazon threat is clear and present in traditional retail sectors, it has been slower to enter the healthcare and drugstore sectors. Amazon’s recent forays into the healthcare sector, by way of its partnership with J.P. Morgan and Berkshire Hathaway and its acquisition of online-only pharmacy PillPack, indicates it has ambitions to diversify and conquer even more sectors. Collaborating with tech players such as Microsoft and Alphabet could help drugstore titans remain relevant in a fast-changing tech-driven market—and ward off the Amazon threat. Tech-driven partnerships may be increasingly important for drugstore retailers to remain relevant but are equally beneficial to tech giants too: by partnering with large firms, Microsoft can increase adoption of its products and grow market share faster. We expect to see more such collaborations through the year.